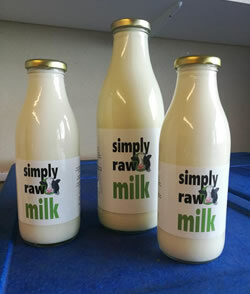 Simply Raw Milk is not processed but milk straight from pasture fed cows with nothing taken out, it is not pasteurised or homogenised and has a wonderful creamy taste. 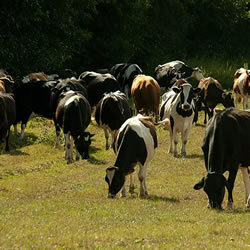 We are a small family dairy farm located in the beautiful Quantock hills in Somerset and have been here as council tenant farmers for over 40 years.We are passionate about producing tasty first class milk which comes from happy and contented cows grazing on succulent pastures. Whilst not registered organic we do not use hormones and the milk is antibiotic free. The calves stay with their mothers in the field for as long as possible. We have an FSA license to sell the milk directly to the public and the cows and milk are regularly tested. This entry was posted in Dairy and eggs, Keynsham, Markets, Producers. Bookmark the permalink. Both comments and trackbacks are currently closed.